Pest infestations have become something very common, especially during the summer and spring months, when any type of insects can enter our homes. Yet, property owners play an important role in creating favourable infestation conditions, especially for ants. These little, little peculiar creatures have an interesting behaviour which often raises very interesting questions we have now got the answer to. 1.How Can I Find Where Ants Are Entering My House? Most ants infestations are obvious, as homeowners will spot ant workers or winged females in their property. Most of them form foraging trails by emitting pheromones, thus attracting the other colony members. Most ants leave trails specific to their species. Pharaoh ants can be seen swarming around your household in search for food. Argentine ant signs of infestations are very obvious. You’ll see their foraging trails along building walls, trees and in homes. Ghost ants workers crawling within your bathroom or kitchen. 2. What do ants eat? There are a few types of ants, which invade human dwellings. Most of them are omnivorous and they can survive on various types of food. Yet most of them prefer sugary foods. Pharaoh ants are not choosy, they like eating everything including other insects. Yet, they have a sweet tooth and would prefer sweets to anything else. Pavement ants like eating human food like meats, seeds, grease , as well as aphids honeydew, dead of alive insects. When they’re outside, Ghost ants prefer honeydew, they often get from aphids. When they’ve infested your property, they’d go for the sweet food you left unattended. They are also known to hunt insects in order to feed they colony. Argentine ants are not picky eaters, meaning they can survive on any type of food. However, they’d rather munch on sugary foods. 3. Why Do Red Ants Bite People But Black Ones Do Not? 4. Why Do Ants Bite People ? First, “bite” is not the exact term and second, the majority of ants are peaceful creatures. 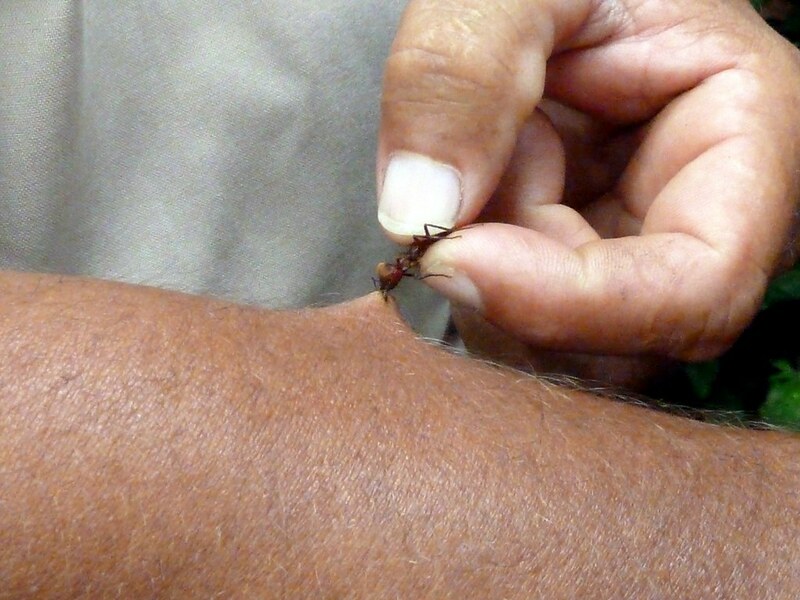 Some species “bite” with their jaws and others sting by releasing formic acid on the attacker’s skin. But they never attack, because they want to ruin your day. If they can’t escape and feel their colony is threatened, you will be stung. 5. Can Ants Crawl In Your Ear While You Sleep? There’s a similar question regarding spiders and the answers in both cases are the same. No, ants won’t crawl on you on purpose just to make your life a living hell or scare the wits out of you. There are posts about ants which killed people by crawling in people’s brains. And still, the idea they could crawl into your ear and eat your brain is ridiculous. Even if they crawl in there, they’d have to go through the hairs, ear wax and living tissues. Having, by some luck, passed through these, they’d have to go through the dura mater, membranes called meninges and God knows what else. So, logically, they don’t have any interest in crawling up your ears and munching on your brain. 6. How do you stop ants getting in the house? There are tens of DIY solutions which are natural insecticides. But in most cases they won’t help and you’d have to call an expert ant controller in London. The only thing you can do is try to keep your home as clean as possible and not leave food, especially sweets, here and there.